1. His full name: Edward Leo Peter McMahon, Jr.
2. 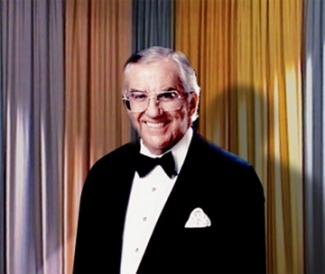 McMahon is best known for The Tonight Show and his role as the American Family Publishers sweepstakes spokesman, but he was also a spokesman for Budweiser, co-host of the Jerry Lewis Labor Day Telethon and hosted Star Search from 1983-1995, where he helped launch the careers of Search contestants like Christina Aguilera, Britney Spears, Justin Timberlake, Drew Carey, Brad Garrett, Dave Chappelle, Kevin James, Martin Lawrence, Dennis Miller, Alanis Morissette, Rosie O’Donnell, Ray Romano, Adam Sandler and Usher. 3. The Tonight Show wasn’t the first McMahon/Johnny Carson co-starring gig. McMahon was hired as the announcer on the ABC game show Who Do You Trust?, hosted by Carson, in 1958. 4. Among his other jobs: a circus clown on a Philadelphia TV show, veggie slicer salesman on the Boardwalk in Atlantic City, door-to-door cookware salesman, shoe shiner, dry cleaner, bingo caller and a World War II flight instructor and Korean War pilot. 5. His great-great-great-grandfather, Patrice de Mac-Mahon, duc de Magenta, served under Napoleon and later served as the President of France from 1873-1879. 6. McMahon claimed that mayonnaise was originally called “Macmahonaise” and was named after his great-great-great-grandfather, who loved the condiment. 8. McMahon was a fan of The O.C. 9. He also co-hosted a TV Land talk show with ALF. 10. McMahon played Duncan, the big baddie who was causing trouble for Jim Brown‘s titular character in the 1973 blaxploitation flick Slaughter’s Big Rip-Off. “They’re gonna get Slaughter, or get slaughtered!” says the announcer in the movie’s trailer. Conan O’Brien‘s debut as Tonight Show host may have gotten mixed reviews, but the episode did get the highest ratings for a Monday night Tonight installment in four years. Some people were down on the fact that much of the episode seemed like an introduction to Conan, but, hello, a lot of the regular Tonight Show audience doesn’t stay up for the post-Tonight hour. 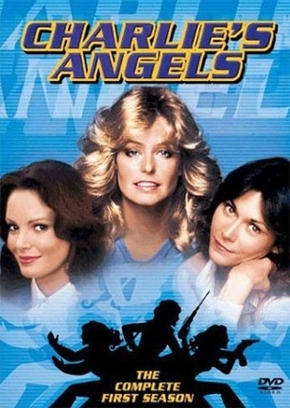 I thought it was totally appropriate, particularly the clever cold opening, which had Conan running across the country, from his old New York City home to his new Hollywood studio. It was a nice nod to the fact that Conan and crew realize they’re playing to a broader audience on Tonight than they were in their 12:30 timeslot. What did you think? Is Conan Tonight Show-worthy? Will the new Tonight Show be a nightly appointment for you? 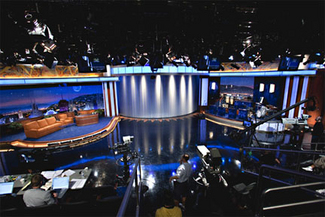 Here it is, Conan O’Brien‘s Tonight Show set, where he’ll begin hosting the talk show on June 1. What do you think? I kinda dig the orange and blue thang he’s got going. Do you suppose the orange accents are a nod to his hair?